I've been on the site for a couple months, I've owned about half a dozen non-CJ Jeeps, currently 1-****** a 51 PU (that I need to get rid of since I'll never get around to fixing it up) a 64 dual name plate HD pickup, and a 87 Grand-wagoneer. the only previous 'small Jeep" I've had was an early 80's 2WD Comanche. 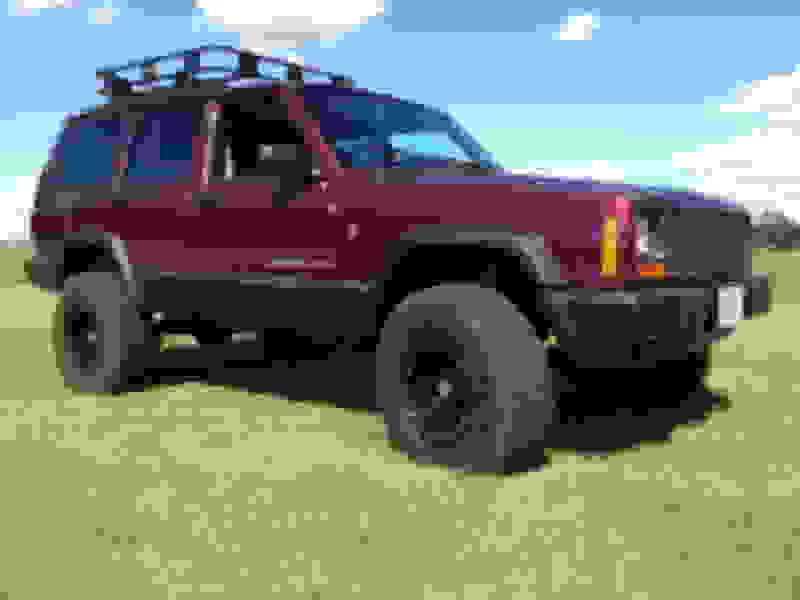 MY current XJ is a 96 2-door that I am currently upgrading for a long hot fast road-trip to extreme south Texas, cowl cold air intake, and injector upgrade installed, seat and console upgrade waiting to be installed, same for JC 62mm throttle body, waiting for new rear custom spring and a Nate roof basket. I have already dispensed with the rear seat entirely inferior of an extended load-bed with secure storage in the former back seat base wells. Hope to get a-side roller awning in the near future and new 4.5" backset wheels and slightly larger tires---probably only 31's. The JK is basically a DD with lots of freeway miles (I drive 2.5K a month for my work) with the only deliberate off-road being occasional Bowhunting, shooting, and flyfishing trips. However living in the SM MI "lake effect snow" belt unintended ones are a strong potential. I posted in the Introductions form. I'm from Lansing and I have been 4 wheeling since 1970. I'm one of the lucky ones that got to race at Sand O Rama(near Benton Harbor) and even snuck over and tried Thunder Mt. Got to race in Toledo and Gravel Rama. Now I have a rust bucket 1991 Laredo. Most of my wheeling is done around Grayling area now. If you see a Rusty Laredo full of English Setters stop and say hi. Chris here, moving from Lafayette, IN to the South Bend, IN area. I currently have a stock four door '01 XJ as a DD, and I've had a YJ and a couple of CJ's in the past. 3 year member...just new to intro's. Craig here. Live near Kings Island. 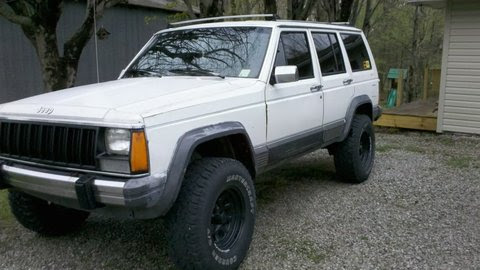 Role with a 99 XJ Cherokee Sport, 4.0, 4x4, d30 with Aussie locker/C8.25 with Richmond Lock rite with 4.56 gears. Running 33x12.50's. 6.5 in Long arm front with 4.5 in rear with Shackle relocators. Zone wj shocks. Home made front bumper w/ receiver. Wow, well not sure how ky is great lake land but..... Im andy, just scored an almost rust free 98 xj, has a few minor issues. im in nky like i can see the glow from cincinnati and drive threw KY IN and OH to work. this is my 3rd jeep and 2nd xj. Hello, Neil from Holland, OH. It is about 20 mile SW of Toledo. 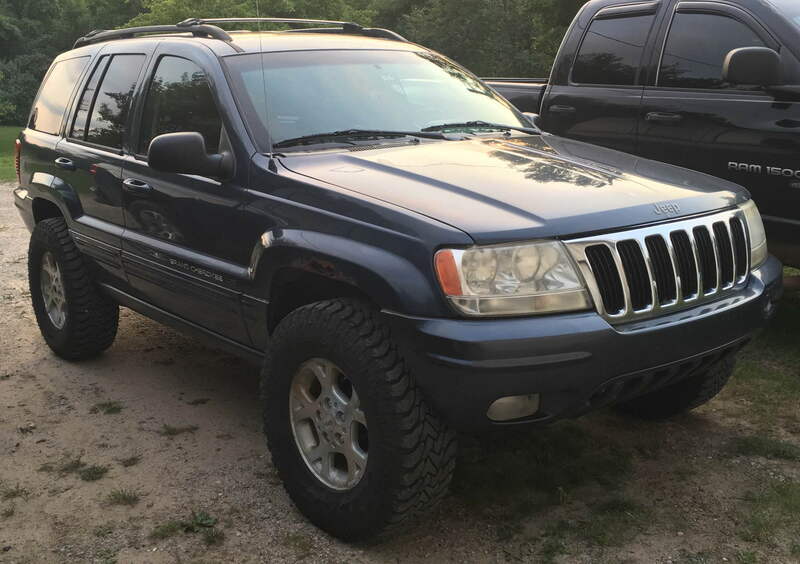 I am actually a returning member after 7 years and do not have another Cherokee yet. I am, however, looking to purchase one in the beginning of Feb. Purchased a 98 Cherokee as a winter beater in September. Has some rust, engine knock, and a few other quirks but besides that has been perfect for me. Joining to see if anyone in the Dayton area has any recommendations for shops or mechanics. Looking to do a 3" lift and weld on some new rockers. What's up Great Lakers! Representing Henry, IL. Had a 97 TJ Sahara with both tops, but sacrificed it for a Tahoe when the kids were young. Now I have an'04 Grand Cherokee Laredo, and just built my first XJ... a 2001 Sienna Pearl Cherokee Sport. Look forward to chatting it up with y'all. I posted the following in the "Ohio Roll Call" thread. I thought I'd introduce myself here, and post my Auction Watch; Cherokee update. 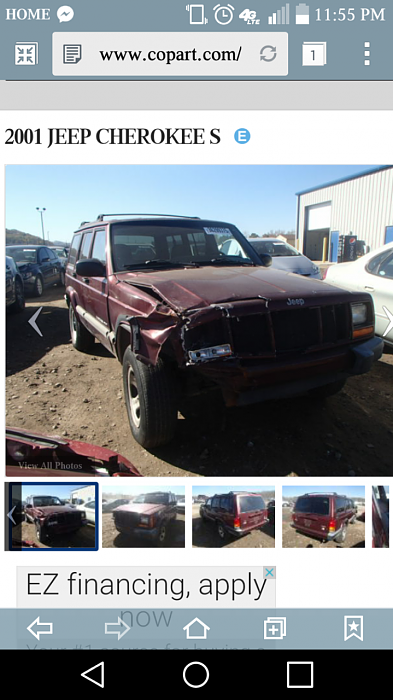 For reference, we're discussing the 2001 XJ with 137K I went to see at the auction on Friday. Finally, an XJ gets posted! And it has low miles! But it has that cylinder head that nobody likes...we'll see. With the "low" mileage (137K), I was prepared to bid up to $1000 if this thing was in good shape. But is was in bad shape, very bad shape. Started right up, clean engine compartment, clean interior (except for cigarette ashes here and there and Hay (like for horses) everywhere.) Bright green antifreeze, clean lenses/signals....the "Good" is done. The whole underside is a rusty mess, like the mighty Titanic at the bottom of the sea floor. The floors are missing, it's just insulation and carpet underneath. The rockers are missing. The leaf springs are almost inverted. A ghost in the glove box. Decent drive-train and interior. Maybe I can use it for parts. 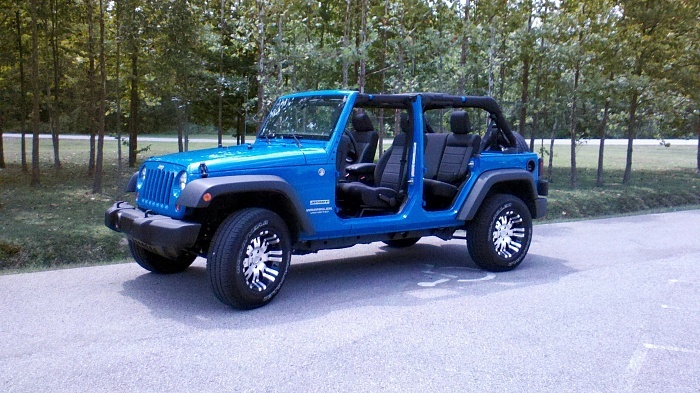 I REALLY want a Jeep. My hand goes up - "$350," I say. Auctioneer wakes up (speaking auctioneer language): "Ok, $350! Blad-de-du-blah, $350, badabow, bow, $400, who's at $400, badee baba, boda bow, $400!" He gets a taker. He points at me "$450, it's to you at $450. $450? Four, Fifty? Bada-bow-bow, $450, bow, bow, bada-ba-ba." I watch MY Jeep pulling out of the garage...I nod - ok, $450. Back to the other guy. "$500? to you at $500, bada-bow, ba-ba $500? Cmon, guys -working 4x4, winter's coming up...who's at $500? Ok! $500!" No. I shake head back and forth, cutting motion across throat – I'm out. He got it for $500. He can have it. There was also a 2000 Wrangler with 117K. A Reposession. It looked to be in good shape to me, pretty damn good. But I don't know anything about Wranglers, yet. I'm still learning Jeeps. Black spray paint job, even the badges, but the interior was in good shape, the frame was solid, the engine compartment looked good. All stock, no lift or tires. It went for $1300. That felt like a really cheap price to me. 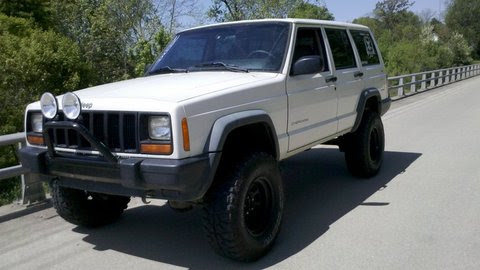 I want a stockish Cherokee to start with. I wanna cut my own fenders, do my own cut and fold. You guys get it. 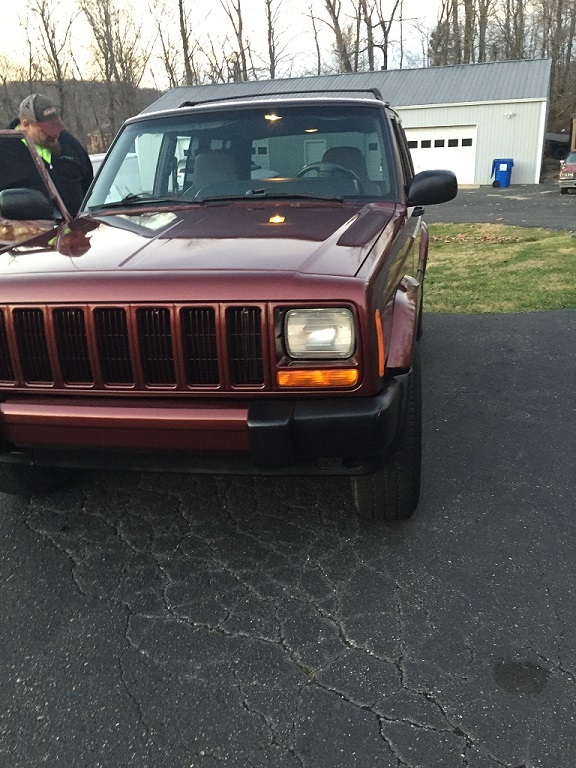 I'll keep updating this thread with my auction adventure, until I find my XJ. Or maybe I'll start an "Auction Watch" thread and keep it updated. I'm trying to find the best way to participate in this forum even when I don't even have a Jeep yet. Looking to meet others in the area, swap stories, share dreams and have fun.